Looking for the best men’s eyeglasses in 2018 so you can stay ahead of the trends? Eyewear styles often change with the seasons, so it can be tricky to keep up. That’s why we’ve put together this guide to the top 10 best men’s eyeglasses in 2018. It’ll guide you through how to find the perfect pair of glasses, along with the most popular frame shapes and colors that are trending this year. Different styles of eyeglasses go in and out of fashion, and 2018 is no exception. Based on fashion shows and street style sightings, we’ve identified four themes that are particularly hot right now. Eyeglasses have been associated with nerds since the dawn of high school, but in recent years something has shifted. Nerd style glasses are now much sought-after and no longer a domain of the hopelessly uncool. Depending on your look, nerd style eyeglasses can be hard to pull off. Go for thick frames in unusual colors or metallic accents for the best result. This will create a contemporary look with that extra bit of flair. Some of the best men’s eyeglasses in 2018 are those with hipster style frames. They’re particularly popular with celebrities who have helped to drive their acceptance in the mainstream. Hipster style eyeglasses strike a perfect balance between intellectual and cool, which is a versatile look that suits a wide range of people. 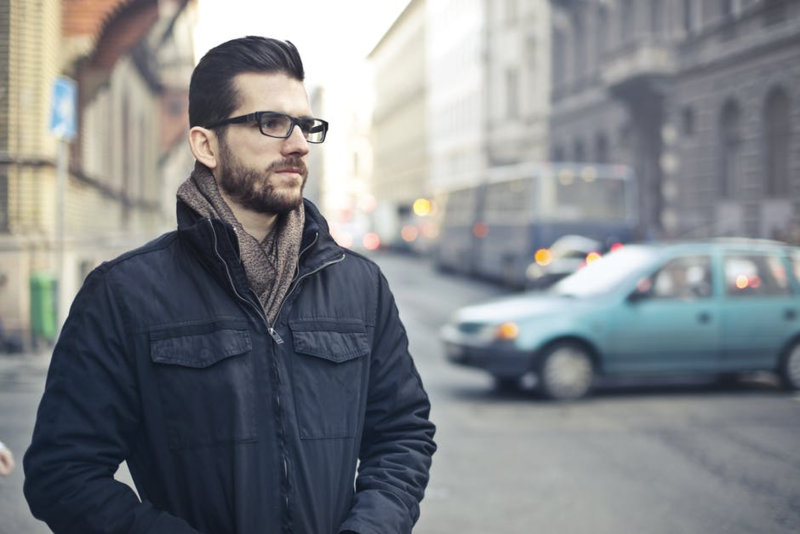 Hipster style eyeglasses tend to have thick rims and simple lines. They’re often square shaped in solid black or trending colors. You can also find them with patterned frames, although these tend to date faster than block colors. Young creative types in gentrified areas often gravitate towards this style, followed by others who want to replicate their look. This makes hipster style eyeglasses one of the best and most popular options for this year. Some of the best men’s eyeglasses in 2018 will actually be from previous eras. Vintage style eyeglasses have made a resurgence in recent years and look set to continue for the foreseeable future. To create the vintage look, go for oversized or exaggerated frames with thick rims. Aviator and wayfarer shapes are both retro-inspired yet bang on trend for 2018. Just don’t go for second-hand eyeglasses found in vintage shops, since the lenses won’t be tailored to your sight. This can negatively affect your eyesight, making things hard to read and causing headaches. Classic style eyeglasses never go out of fashion. Their timeless appeal comes from minimalist lines and neutral colors which means their look doesn’t date. Black, gray, brown, or tortoiseshell frames will match any outfit and will look just as trendy into 2018 and beyond. Classic style eyeglasses are well-suited to professional or traditional work environments, but this doesn’t mean they’re boring. In fact, the classic look exudes a timeless sense of fashion and style that goes beyond what’s trendy this season. Oval, round, or rectangular frames can create a classic look. With neutral color choices, these eyeglasses are ideally suited for business situations or evening activities. This timeless style remains one of the best for men’s eyeglasses in 2018. With these major style trends in mind, let’s dive into the top 10 best men’s eyeglasses for 2018. If you’re a fan of vintage fashion, then browline eyeglasses may be your new best friend. They feature thicker rims at the top and were incredibly popular in the 50s and 60s. Ready to channel a Mad Men retro vibe? Then browline eyeglasses are your best bet. This style is ideally suited to people with narrow faces. This face shape often needs a bold frame to focus attention on the eyes and browline glasses do just that. Oversized glasses are super-trendy right now. If you’re looking for a bold fashion statement, then these are a good bet. They suit lots of different face shapes and exaggerate your personal style. The key to choosing oversized eyeglasses is to pay attention to their width. Although they’re intended to be larger than average, you don’t want them to drown your features. Choosing glasses that are the same width as your cheekbones is a good rule of thumb. Metallic eyeglasses aren’t anything new, but most are made from either copper or nickel. Although they’re easy to adjust and resistant to corrosion, they can’t match titanium’s pure strength. This metal is also easy to color which means you have even more options to choose from. Titanium eyeglasses tend to have thin rims but come in a variety of shapes. They’re lightweight so hardly noticeable when you’re wearing them yet make a clear fashion statement. Titanium is also a good choice for people with allergies since they’re hypoallergenic. Square frames are a hipster favorite and one of the best men’s eyeglasses for 2018. Black has been the most popular frame color in recent years, but there are lots of alternative options. Dark brown creates a similar look without the stark contrast and suits a wider range of people. You could also opt for a bold color if you’re looking to make even more of a fashion statement. Square frames are particularly flattering for people who have a round or oval face. This is because the angular shape of the eyeglasses contrasts the face shape rather than exaggerating it. 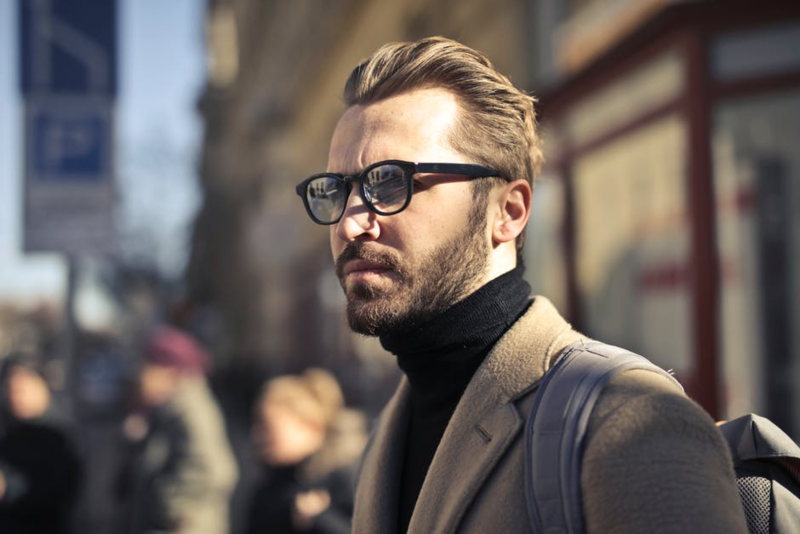 Flat-topped eyeglasses create a statement look and are some of the best men’s eyeglasses for 2018. Their clean lines portray a minimalist look that never goes out of fashion. With medium-thick rims, they also provide the perfect opportunity to showcase a little personality through your choice of color or pattern. Speaking of showcasing personality, horn-rimmed glasses are an excellent option. Although renowned as a traditional style, this year we’re seeing a move towards bolder color options and pattern choices. You can tailor the glasses to match your style and put your own spin on the current nerd look. Round eyeglasses seem to be most associated with John Lennon, but there’s no reason you can’t take this look and make it your own! If you like the vintage look then round eyeglasses are a great bet. They’re iconic and timeless but be warned – they aren’t for everyone. It’s important to choose eyeglasses based on your face shape as well as your fashion preferences. Round eyeglasses tend to exaggerate a round face, so will be more suited to people with a square or angular jawline. Pair them with a jaunty hat for a classic festival look. Whether it’s eyeglasses or sunglasses, wayfarers are a classic style that never goes out of fashion. Their unique shape means they suit a wide variety of facial proportions. Whether you have a round face, oval face, or heart-shaped face, wayfarers are going to look great on you. If you’re looking for wayfarers that are bang on trend, then try playing with different color options. Amber tortoiseshell or clear frames both put a twist on tradition whilst making a clear fashion statement. Thick-rimmed glasses are a fashion favorite and staple look for 2018. It may seem like they’ve been around for several seasons, but their popularity shows no signs of waning. Indeed, thick-rimmed black eyeglasses may eventually shift from the hipster category to a classic look! Celebrities and creatives absolutely love this style, so why not give it a go? Since they tend to be rectangular frame glasses, they’ll suit people with oval or round face shapes. Most online retailers allow you to try several styles before adding custom lenses, so you’ve nothing to lose! Aviator eyeglasses are a celebrity favorite and look eternally stylish. They were designed for pilots back in the 1930s and provide decent eye coverage no matter which direction you’re looking in. The frames are usually metal but come in a huge variety of color coatings, so you can find the perfect pair for your own personal look. They’re best suited to people with a square or rectangular face since the curves of the glasses provide contrast and balance. However, people with round or oval face shapes should avoid this style and opt for something a little more angular. By following our guide to the top 10 best men’s eyeglasses in 2018, you’ll know exactly what’s on trend and whether it’ll you. Choosing a great pair of frames or glasses online can be daunting if you’re unsure how they’ll look, so look for retailers who enable you to have a virtual try of different pairs of glasses using webcam technology. It’s also important to check out their reviews so you know if they’re high quality and durable. For more info on men’s eyeglasses, sunglasses, or other eyewear products, check out our different categories.